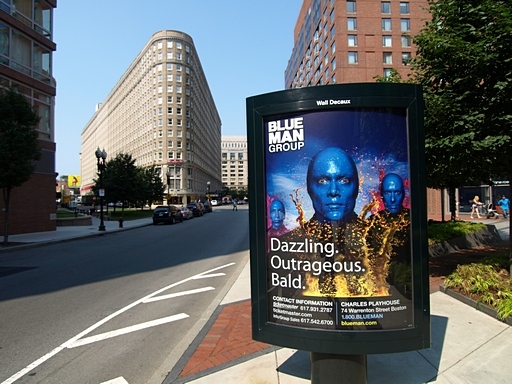 One of the first things to do in my Boston travel planning is to get tickets for the Blue Man Show (one of the best multi-media shows in USA). To promote e-Commerce, I of course first visited their official ticket site – www.ticketmaster.com to buy tickets. Unfortunately, all tickets were sold out for all the days I’d stay in Boston, according to the website. Therefore, I decided to leave it to the last resort – C-Commerce (i.e. Concierge Commerce). I checked into the hotel and immediately asked the concierge for help … and the gentleman kindly promised to help and get me the ticket. The next day the gentleman told me the good news – ticket with seat 5 rows from the stage and it cost only US$ 58 plus US$ 5 handling fee (i.e. together US$ 63 a ticket, which I was very happy to pay for the services). Lesson learnt – Ticketing websites still cannot replace a good concierge.